A scheme which sees schoolchildren across Sefton receive vital advice and tips on staying safe from gangs and crime is being honoured by the government’s Victim’s Commissioner. Baroness Helen Newlove will visit St Oswald’s Primary in Netherton later this month to observe the successful partnership between Sefton Council and the Get Away ‘N’ Get Safe (GANGS) initiative. 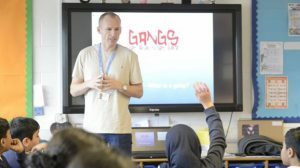 GANGS course leader James Riley, a former probation officer, works closely with Sefton Council’s Localities teams to deliver an intensive educational, preventative and diversionary programme to schools across the borough to warn young people on the dangers of gang lifestyle. The work by GANGS and Sefton Council has now been recognised on a national level, with Baroness Newlove observing a session at St Oswald’s on January 25 as an example of best practice. Cllr Trish Hardy, Sefton Council’s Cabinet Member for Communities and Housing, said: “Through our Sefton Safer Communities Partnership we identified that there was a need for a project that could be implemented at an early stage to deter children from making bad life decisions. James Riley, founder of GANGS, added: “The partnership between GetAwayNGetSafe and Sefton has developed incredibly well over the last few years. “We want to use GANGS to inspire young children at an early age to make positive decisions about their lifestyles in the future. Emma Murtagh, Head Teacher of St Oswald’s, said: “James has worked with a number of our pupils over the years and the partnership has been invaluable. “The workshops are informative and provide an insight into the dangers of being in a gang, as well as how the law works. Could you help someone with dementia keep doing the things they love?